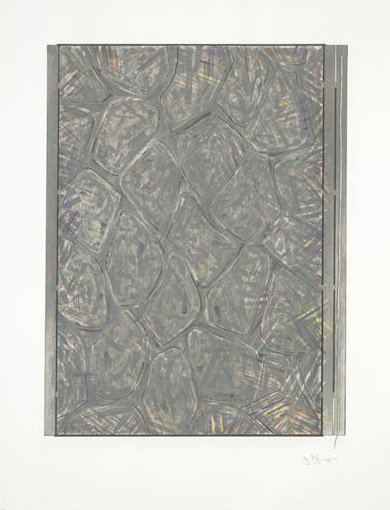 Jasper Johns's ongoing stylistic and technical experimentation place him at the forefront of American art. His richly textured paintings of maps, flags, numbers, and targets laid the groundwork for Pop Art, Minimalism, and Conceptual Art. In New York in the 1950s, Johns was part of a community of artists, including Robert Rauschenberg, seeking an alternative to the emotional nature of Abstract Expressionism. Influenced by Marcel Duchamp, Johns's early work paired the concerns of craft with familiar concrete imagery. His interest in process also led to innovations in lithography, screen-printing, etching and woodblock, using such materials as pencil, pen, brush, crayon, wax, and plaster to constantly challenge the technical possibilities of printmaking.